Faulty microwave ovens will only occupy space on your counter. Give us a call if you need microwave repair in Calgary, AB. We fix such small appliances and hurry to offer assistance to all residents in Calgary, Alberta. The components of these kitchen appliances wear and burn out just like with any other unit. And when they do, problems begin. What we do at Calgary Appliance Repair is check the roots of the problem and if needed, replace parts. Looking for specialists in microwave repair near you? As a local service provider, our company can help you quickly. Our techs are skilled and can repair all types of microwaves. Whether yours is a counter, built-in, or over-the-range microwave, it makes no difference to us. With extensive knowledge and years of experience, our techs can repair even the latest models. With microwave service expertise, our techs can fix any problem. Most common issues with these appliances have to do with the way they heat up. If they fail to do so or take too long, call us. You should also contact us if the microwave won’t work at all, smells funny, makes a noise, or its turntable won’t rotate. We have the required troubleshooting skills to check well and diagnose microwave oven problems. With repair parts in our vans, we can replace any damaged component on the spot. Our Calgary microwave repair techs are always well equipped when they come to provide services. We have experience in small appliances service and can fix most problems with your microwave. Don’t throw it away before you let one of our pros check whether the problem is fixable or not. We are honest and experienced and such qualities ensure exceptional customer service. Whatever your microwave oven needs are, we cover them. Just let us know if there is trouble with this special, small oven and one of our kitchen appliance techs will take care of it. Call us today. 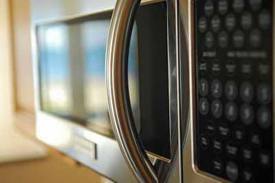 We will cover your microwave repair Calgary requirements as soon as possible.